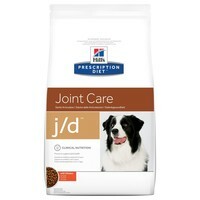 Hills Prescription Diet JD Joint Care Dry Food for Adult Dogs has been formulated to soothe aching joints and help improve mobility in as little as 21 days. Designed to preserve healthy cartilage and improve joint mobility, Hills J/D contains natural sources of Glucosamine and Chondroitin that slow the degeneration of existing cartilage and help new cartilage to form. Hills J/D Joint Care also contains L-Carnitine that will help your dog to maintain a healthy body weight.